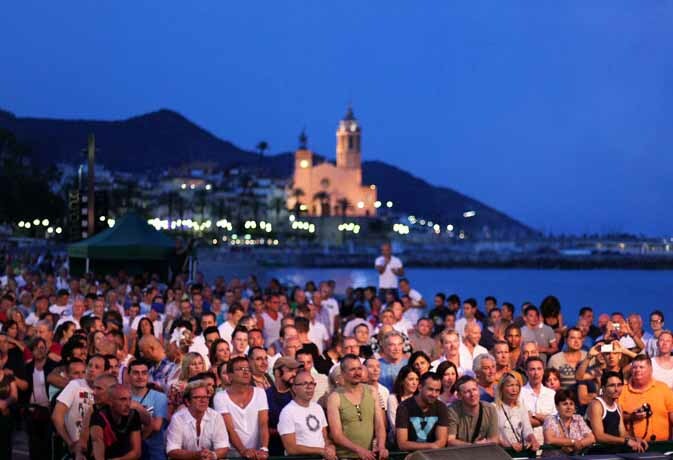 Sitges will host the 9th edition of the Gay Pride Sitges between the 14th and the 18th of June 2018. Five days of fun, music and parties by the Mediterranean Sea. Sitges is known to be one of the best gay destinations in Spain. The location, very close to Barcelona, the great beaches, the restaurants the nightlife, and of course, the gay-friendly environment turn this small town into a great holiday destination. So it is no surprise that the Sitges gay pride has become one of the biggest events that take place in the seaside village. Every year more and more people go to Sitges to celebrate the gay pride and participate in the already famous parade. On previous years, more than 60.000 people filled the town with colors during the five days that the event lasted. The parade will take place on Sunday June 17th at 5pm. This is the main event and the highlight of the pride celebrations. It goes along the seafront and it lasts approximately 2 hours. Anyone can watch the Sitges pride parade for free from the streets, but if you don't want to miss anything from the afterparty in the Gay Village and the concerts, you can buy a VIP pass. This VIP pass will also allow you to be part of a float during the parade. Even though the parade is the biggest attraction of all the pride celebrations, there are special acts and performances scheduled on a nightly basis. Most of the action will take place in the Sitges Gay Pride Village, which is a small, temporary and custom built village with bars, food stands and a stage. It is located by the seafront on the Passeig Marítim and it opens every day from 5pm (Sunday will be an exception, opening at 3pm for the Parade warm-up). The Pride T Dance will mark the kick off of the night every evening at 5pm, so you can go for a cocktail and a dance after a day at the beach. Every night the Gay Village will offer DJ sessions, Matinée Circuit Parties and tributes to big artists, such as Prince, Madonna, Michael Jackson and Boney M. If you are only visiting for a day or two, you can check the gay pride Sitges 2018 schedule and buy the tickets for the shows you want to go to in advance. Make sure you also check all the theme nights and after parties of the Gay Village during the pride: White Night, Glitterbomb, and many more. If you are planning on going to Sitges to celebrate the pride, we would suggest you to stay there, especially if you want to assist to more than one event. Of course, you can get to Sitges with public transport from Barcelona, but having to depend on train timetables when you are having fun doesn't sound that great. As you can imagine, due to the amount of visitors during those days, it is highly recommendable to book the accommodation for the Gay Pride Sitges in advance. Image from the Gay Sitges Pride official website.